Come and join team Ireland today. We would love to have you with us! Join our team; Click here to join team Ireland on any BOINC project! 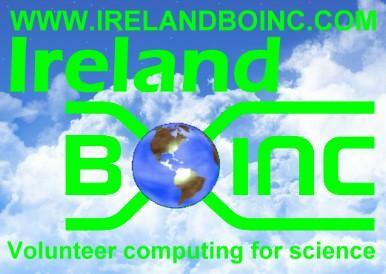 Team Ireland is registered on all the scientific projects that use BOINC software. Some of the more popular projects include SETI@home, Einstein@home, Climateprediction, Rosseta@home, World Community Grid and many more. If you are running other BOINC projects, then come to the team website and join team Ireland on those projects also as all the projects are separate. Team Ireland has a very cool team website linking all the BOINC projects. The website is an Internet forum so you can register and join in the chat. It has lots of team information to help you learn about all the science projects. Come and visit the team website regularly for the latest news and do join in the chat or post a message to say hello. Thanks for reading my profile and i hope we can chat soon on the team website.